Free Download StationPlaylist Studio 5.0 - Automation playout tool for a studio or DJ. 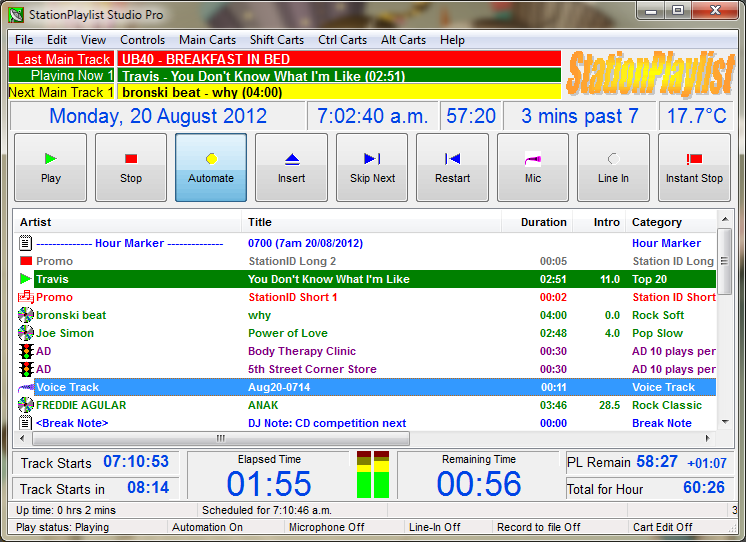 StationPlaylist Studio is a simple software for broadcasting digital audio. It can be used in studios as well as by DJ's for professional audio playback. It offers a streamlined interface with large control buttons that supports automation and live assist operation. The Studio can use audio files in various formats including MP2, MP3, MP4/M4A, OGG, WAV, FLAC, APE, WMA, SND, AIFF, CDA. The Studio will automatically load playlist files every hour, and play the audio files in an automatic or live assistance (manual) mode, as scheduled by music scheduling software. The tool understands M3U playlists generated by many schedulers. But to use such advanced features as timed events, break notes, and voice track overlapping, you will need playlists produced by StationPlaylist Creator. StationPlaylist Studio together with the StationPlaylist Creator music scheduler offers the complete solution for radio stations and Internet broadcasters. It is also possible to insert tracks manually for doing live shows. To simplify the operation of software for live assistance Studio has only one player though it manages multiple players internally for automatic voice track and song intro overlapping. The Studio provides a professional automatic and manual crossfading system to deliver professional crossfading with one soundcard and no need for track editing. The Studio can read artist, title and other information from the existing file tags or use the filenames if there are no tags. It can send artist, title, etc. directly to your streaming server to update the metadata. Your listeners will be able to see what's playing in their media player. For internet stations, the software can provide listeners statistics. - up to 96 slot cart machine for instant jingles, sound effects, etc. - unlimited number of users/DJ's. StationPlaylist Creator 5.0 - Create your radio station format by generating playlists for up to 90 days. StationPlaylist Studio 5.0 - Digital audio playback software for radio broadcasting and Internet streaming.